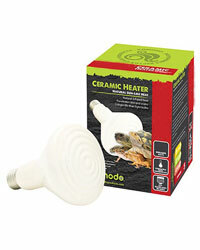 Komodo Ceramic heaters provide excellent levels of heat but emit no light. This makes ceramic heaters ideal for enclosures that require a proper photoperiod with nighttime and daytime elements. Ceramics are the ideal heater choice for customers who want to breed their reptiles or those who want the best equipment and want to 'do it the right way'. The Komodo White Ceramic Heat Emitter provides an efficient radiant heat source which creates a natural sun-like heat without visible light. Suitable for 24 hour use, they are ideal for constant radiant heat to simulate desert or tropical environments and help to increase the ambient air temperature to warm the skin, scales & bodies of reptiles. This product must always be used in conjunction with a thermostat.